Comedian Jon Stewart and his wife have picked up a rogue bull that escaped from a New York City slaughterhouse Friday morning and ran loose on a college campus in Queens, according to police. It's the third animal set for slaughter to get loose in Queens this year. 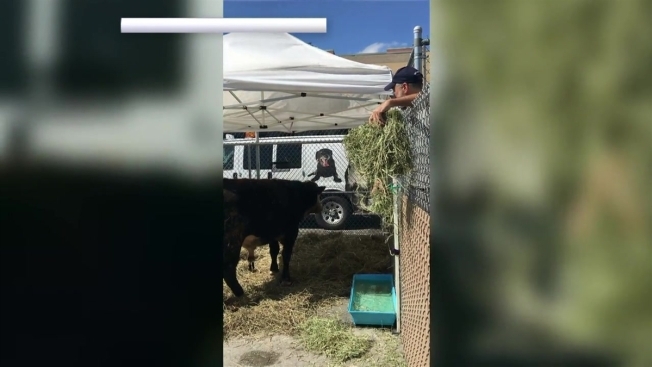 The Angus bull was being unloaded from a truck at a slaughterhouse near York College in Jamaica, Queens, when it broke free and ran off around 10 a.m., according to the NYPD. Video from the scene showed the bull running through a field. At one point, the bull can be seen charging a person as several other onlookers run away. Officers caught up with the escaped bovine on a campus green and used a rope to lasso the animal. They fired two tranquilizer darts into the bull's rump to subdue it. Police took the bull to Animal Care & Control in Brooklyn, according to police. The animal was in good condition, animal control officials said. Stewart and his wife Tracey, animal advocates who last year announced plans to transform their New Jersey farm into a center for neglected animals, went to pick the bull up and bring it to the Farm Sanctuary's shelter in Watkins Glen, New York, according to a spokeswoman for the shelter they are affiliating. The location will become the fourth property affiliated with Farm Sanctuary, an animal advocacy organization that was founded in 1986 to combat factory farming and encourage awareness about farm animals. It's set to open in 2017. York campus police and administrators have declined requests for comment. Another bovine escaped a slaughterhouse in January and ran through the streets of Queens before police eventually wrangled the animal in a parking garage. The escapee — nicknamed "Freddie" after Queen frontman Freddie Mercury — was taken to an animal sanctuary in New Jersey. That same week, NYPD officers paid $40 to bail out a goat that escaped another slaughterhouse, then took the animal, called "Merrick," to a rescue facility on Long Island.